I guess I have a soft spot for Berlinettas since my first car was a black 1982 Berlinetta that I drove for 200,000 miles. My car was a V6 with the 4-speed manual, which was fun to drive in its own way, but it was obviously way down on power. That's why this car is interesting: this Berlinetta has a V8 with the 5-speed manual (which only became available in 1983). It's also a low mileage car (less than 11K miles). Last edited by JohnFB; 01-12-2019 at 11:54 AM. Last edited by JohnFB; 01-12-2019 at 11:56 AM. It looks like a monster truck with those 14" wheels and pizza cutters. Unfortunately, I'd bet this car won't get much attention. Being an 83 Berlinetta, it doesn't even have the features that make a Berlinetta unique. It's just a Sport Coupe with plush seats, extra carpet, and heinous gold badges and wheels. Ugly for days in it's special 80's way. On the flip side, maybe it'll stand out from all the 1LE hype and Irocs... Yeah, probably not. I'll bet it sells like a 6cyl. Anyone think it'll crack 10k? I really like this car. If the price was right I would seriously consider putting an offer on it. Well, as I said, I have a soft spot for Berlinettas. 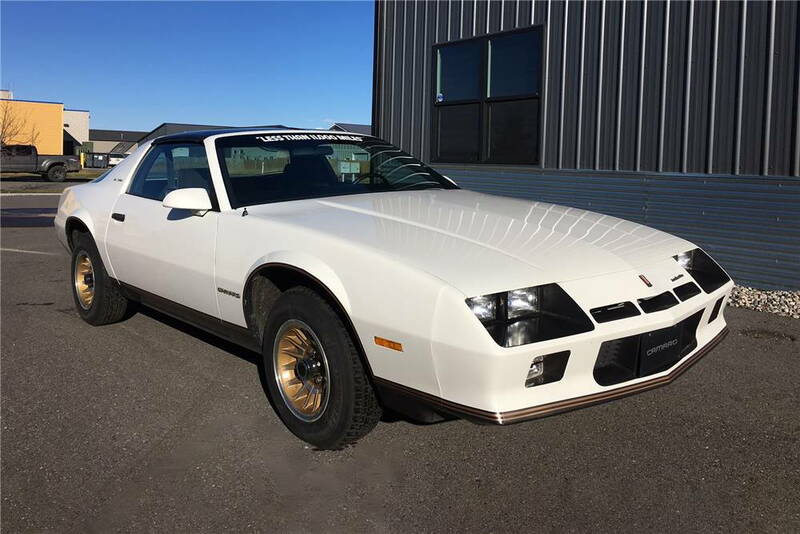 The 14" wheels may look too small to modern eyes, but back in 1982 and 1983, all the non-Z28 Camaros had 14" wheels, so it didn't strike us as strange. I think the gold trim and rear spoiler deleted give the car a very unquie look. 82 and 83 only,..... the 84 and up Berlinetta was not produced with a V8 and a stock Stick. I've got a soft spot for Berli's too. In HS, my GF had a mint 85. Burgandy, 305, digital dash and the weird radio pod. I remember driving that thing all over the place! Drove SO nice! for both Berlinettas and Sport Coupes that year (certainly not true in later years), implying the only V8 stick shifts in 1982 were Z28s. 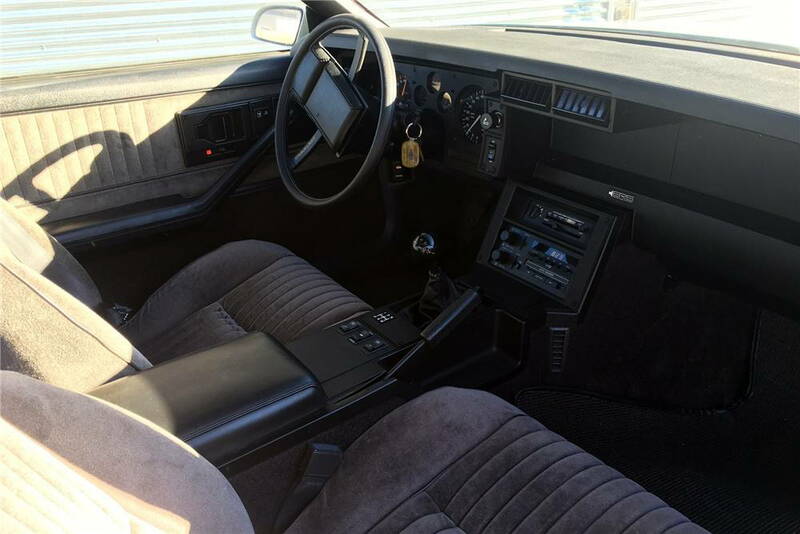 It looks to me like the stick shift V8 Berlinetta was a one year only option (1983). I have to say I have never seen a V8 5 speed Berlinetta until this car popped up. Well, since the auction for this 1983 Berlinetta will be going off in a couple of days, I'll make my wild guess regarding the final bid: $7500. I going to Barrett Jackson Wednesday. Going to check it out in person. But this auction is all about inflated prices so I doubt I could get it for a decent price. Well, if you're going to the auction, good luck on the bidding!! Yup, you were spot on! I did see the car in person. It was like a brand new Berlinetta! Last edited by burnout88; 01-17-2019 at 12:43 AM. Is it really that easy to make money by flipping cars like that? He must be counting on a $10K purchase price if he sees any profit. That’s a local dealer here in Phoenix. If the car sold for $7,500 what did Barrett-Jackson charge for a sellers fee? ... dare I say, almost Firebird like. This web page shows $8250, so I guess the fee was $750. Looks like the dealer wants 10,900 for it so a $2,600 mark up from the dealer. Honestly, it’s going to be a hard resale. Very very limited Market on an 83 Coupe. Yes, I agree. When I predicted $7500 above, I was thinking of a retail price, not wholesale. $10K sounds a bit high to me, unless you find the rare buyer (who really loves the car and just has to have it). Well, the Ebay auction ended at $5,899 (didn't meet reserve). It will probably take that dealer a while to find the right buyer if he wants to make a profit. Everyday the 3rd gens price is going up, up ,up ,up ,up! im not sure a 10,000 mile 5 speed v8 camaro selling for 7500 and the seller probably walked away with 5-6k means the prices are going up ..
Not sure about that particular Camaro but there certainly is an upward trend. More than anything it probably has to do with the buyers being the people that are nostalgic for the 3rd gen as evidenced by the OPs first sentence. Last edited by skinny z; 02-04-2019 at 10:34 AM. When it comes to Sport Coupes and Berlinettas, I guess the question is whether nostalgia will directly increase their values. spot for Berlinettas, but also for third gens in general. increase the value of Sport Coupes or Berlinettas, as it may end up being focused on the performance models instead. I suspect this is true of other cars as well -- first gens, Corvettes, Mustangs, etc. much more manageable in the snow, as I used it year around in the Northeast. But now I bring out my Camaro only when the sun shines, so the IROC is a better fit. Now, if I had room for another third gen in my garage, this Berlinetta might have been interesting to me. But my garage is not that big! I bought my daughter a Coupe (could have been a Berlinetta as I never checked or really cared) when she was in college many years back. With the V6, mileage was decent enough and with four winter tires, it was surprisingly well balanced and predictable in the Canadian winter. Took her and the car to a snow covered parking lot and had her practise some car control. All in all, a decent daily driver. 1991 Firebird F/S, Connecticut, Lots of Mods, One of the nicest!